Glazing is a textile finish that adds luster and smoothness to the surface of the fabric. Many glazed fabrics are plain-woven cotton. A specialized calender (set of metal rollers) called a friction calender, literally rubs the fabric lustrous. Glazed chintz and polished cotton are examples of glazed fabrics. The fabric is first impregnated with wax, starch, or a resin solution using a pad machine. The fabric passes through the solution in a bath, then through pad rollers. Pressure is applied so that the solution is forced into the fabric. The pressure on the pad roller squeezes the excess solution out of the fabric. The fabric is partially dried and passed through a friction calender. The friction calender is made up of three rollers. One roller is a padded roller that moves the fabric slowly between two metal rollers. As the fabric moves slowly between the rapidly moving heated metal rollers, the friction creates heat. The fast moving metal rollers polish the fabric. The glaze will be temporary if the fabric has been treated with wax or starch. The finish will be durable if the fabric has been treated with resins. The glazing will be durable on thermoplastic (heat sensitive) fiber fabrics because the friction rollers produce heat. What Is Glaze Hair Color? A specialized finish, ciréing (sometimes called the "wet look") is similar to glazing. The difference is that very hot rollers in the friction calender are used to add a highly lustrous surface. Again, waxes, starches, or thermoplastic resins are added to the fabric. When thermoplastic fibers are used in the ciré process the fibers slightly fuse, melt, and flatten. The ciré finish on thermoplastic fibers is permanent. When hydrophobic fiber fabrics are given a ciré finish the resultant fabric is water repellent. 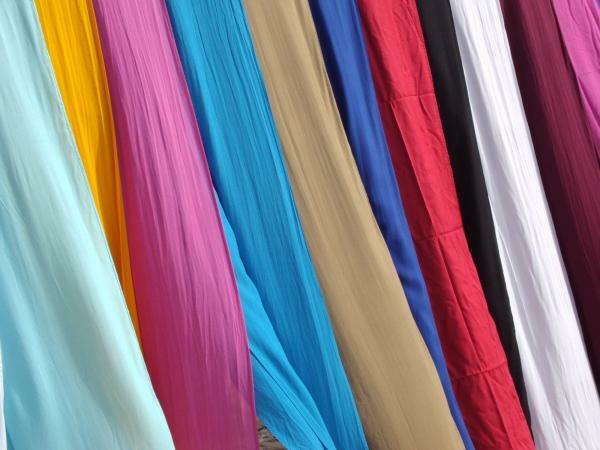 Typical fabrics that are ciréd are taffeta (a filament unbalanced ribbed fabric), tricot (a warp knit), and satin. Glazing can occur accidentally when fabrics are over-pressed. Glazing occurs when a too hot iron is used on a fabric made from a fiber that is heat sensitive. The heat is not enough to melt the fabric completely but does slightly fuse and flatten the fibers. An undesirable sheen that may resemble an oil stain will appear. The damage will be permanent. Another definition for glazing is the pressing of fur to develop a desirable sheen. The pressing aligns the hairs in the fur, thus generating a natural luster and additional softness to the fur. Often a glazing solution using a spray gun is applied. See also Chintz; Cotton; Fibers. Needles, Howard L. Textile Fibers, Dyes, Finishes, and Process: A Concise Guide. Park Ridge, N.J.: Noyes Publications, 1986. Slade, Philip E. Handbook of Fiber Finish Technology. New York: Marcel Dekker, 1998.